Sydney Shop Girl: Game Face. Car USBs. On a good morning, I have 10 minutes to put my game face on for work. Unfortunately, a good 4 of those minutes usually goes to finding the brush, eyeliner or blush I need out of the 8 options for each I have floating around in my makeup tray. I just can't part with any of my makeup brushes. The Sigma ones might shed like crazy but they're so soft and each of the eye ones does a specific job really well. The Bobbi Browns bring back memories of Paris, the MACs memories of North American friends who'd mail me various products at the height of my obsession with MAC cosmetics. The eyeliners and blushes are present because interchanging them from one day to the next makes me think I'm somehow being sensitive to the changing seasons through my use of makeup, like the ad campaigns suggest we all should be. Which is crazy because I work indoors under the same fluorescent lighting year round, the changing seasons doing their thing on the other side of the floor length glass panels. The craziness had to stop and I managed to cull enough of my various makeup security blankets to end up with a collection that would easily fit into this acrylic make up caddy from Aldi. So far, the makeup streamline is working. The job is done now with a minimum of fuss and looking calmly at my neatly organized war paint in the morning is far more pleasant than facing the jumbled tray of stuff that it used to be. Inspired by the success of the makeup caddy system, I attacked my other makeup bug bear - not being able to read the labels of my MAC blushes. I've relabeled them all in large black print on a white background. If only doing my tax return was this easy. It's only taken me two years to figure out how to use the USB port in my car. Which isn't all that unexpected, I guess, if you drive a car that has a button labelled 'START STOP engine' for you to press in lieu of that tricky key business. But seriously, whoever came up with the USBs in cars idea is a genius. Toddler SSG and I were singing along to some of Iggy Azalea's choicest collaborations on the way to the shops, the drive was over almost too soon. Which is saying something as a Sydney road user. And with that, we're at the end of another working week. 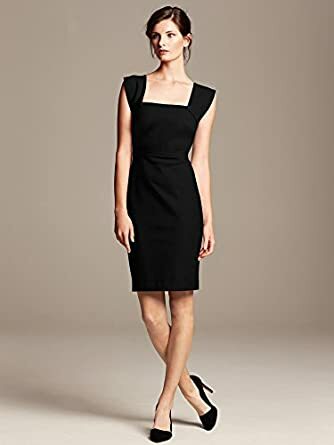 And this dress is coming my way thanks to Mr Roland Mouret via Banana Republic. You'd better get in quick if you're keen because the range launched online yesterday and things are already running out in some sizes. I ordered using the Borderfree option - price in AUD with exorbitant shipping to boot but at least the taxes were included and it was a super easy check out using paypal. Funny, I was just about to tackle my makeup drawers, and I'm having a hard time throwing away my more expensive stuff. I love the dress you ordered!